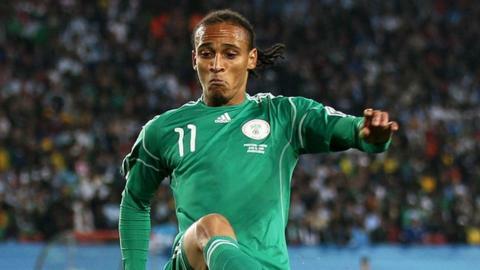 Nigeria striker Peter Odemwingie says his relationship with coach Stephen Keshi has been patched up after talks. The pair fell out after Odemwingie was omitted from the 2013 Africa Cup of Nations squad and took to Twitter to vent his frustration. "I have been speaking with the coach, it's the only right thing to do," the Stoke striker told BBC Sport. "I had to be humble and make a step forward towards my senior colleagues," added the 32-year-old. Odemwingie was upset to be overlooked for the tournament in South Africa and at the time he claimed he was dropped because he often speaks his mind. He also accused Keshi of disrespecting him because he the coach did not inform him personally of the decision. Keshi responded by saying "it was nothing personal" and 16 months on Odemwingie appears to have come to terms with what happened. "You can't continue to stay in that angry state of mind. Staying in that state, it's not the right thing to do. It's never helpful for anyone," Odemwingie said. "It was very disappointing at the time, it was hard to accept it. I had a strong feeling that it was Nigeria's time to win it. I was as frustrated as any other player." Odemwingie was proved right in his instinct that Nigeria's time had come again - they won the trophy for a third time - and he still sounds regretful when he reflects on the past. "I thought we could win it; Cameroon and Egypt were not there, Ghana were struggling and a few players were missing so I felt it was our chance. But I didn't make the squad," he said. "And it would have been the tournament that I would have got scored goals than before, because I had moved to the Premier League and improved as a player - especially in front of goal." Despite his sense that he missed out on a golden opportunity, Odemwingie now seems ready to let the bad feelings go and he is generous in his praise of the players who took Nigeria to the title. "I'm very happy that we won it in the end because many names that had not been in the frame for the squad for the past 10 years were there and they helped the team lift the trophy," he said. He also feels it went some way to making up for, what he feels, had been an underachieving generation. "When we talk about the generation that just passed, we wish we won more for Nigeria. We won silver at the 2008 Olympics, it's good but it's not gold. We won three bronze medals in the Nations Cup, which was still good but the frustrations were there," he said. A maturing Odemwingie, who is soon to be a father for the second time, appears to be finding humility after a difficult couple of years that have included bust-ups with Keshi, the Nigeria Football Federation and also a notorious transfer debacle while at English Premier League West Brom. He credits Nigerian team psychologist, Dr. Robinson Okosun, for helping him, particularly in improving his relationship with Keshi. Okosun visited Odemwingie in Cardiff and told the player that Keshi wished him well and had no hard feelings towards him. And Odemwingie says that in his recent discussions with Keshi, the coach has been consistent in saying that his decisions are taken for the good of the team and not one individual. "For me to hear that was very important on a human level. It's not about people, its always about the country. We're all defending the colours of our nation," he said. "Coach Keshi can do without me at the World Cup and my life will go on as well, but the most important thing is mutual respect. "Now I know how he does things and how he wants things done and vice versa." Looking ahead to this summer's tournament in Brazil, where Nigeria will face Argentina. Bosnia and Herzegovina and Iran in Group F, Odemwingie has declared himself available for selection and Keshi has not ruled out the possibility of picking him. As time has healed the rift between the two men, time will also tell if Odemwingie gets a shot at redemption in Super Eagles colours.